The Brexit talks are again back to the negotiations and the US tax reform bill is leaving impacts on GBPUSD. The support rests at 1.33210 with resistance at 1.34040 which the weekly pivot point at 1.33600 is located in between the lines. The EMA of 10 is moving with bullish bias in the descendant channel and it is above the EMA of 200 and below the EMA of 100. The RSI is moving on the 50 level, the Stochastic is showing downward momentum and MACD line is on the signal line in the neutral territory. The ADX is showing buy signal. 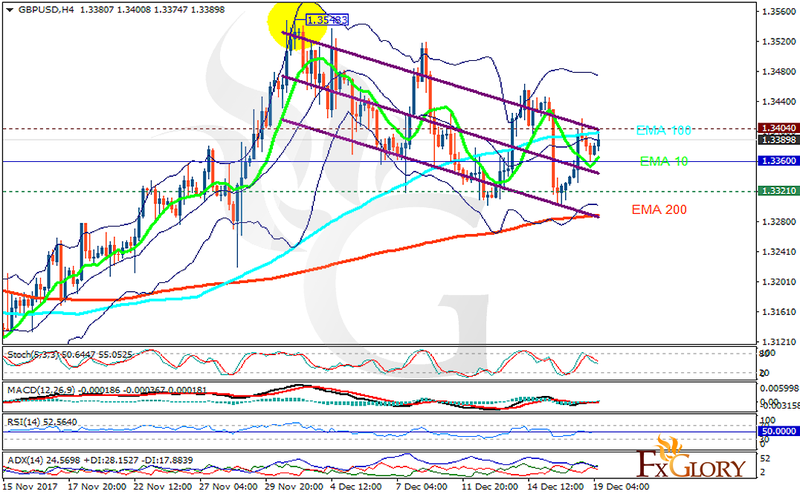 The price is growing towards the upper Bollinger band targeting 1.348.